There was freedom for Liberty. President Obama pardoned the appropriately named turkey at the White House on Wednesday, an annual tradition before what the president said was "one of the best days of the year to be an American." (see video below). Actually, two birds will be spared from the holiday dinner table, Liberty and Peace. But Liberty enjoyed the national spotlight during a brief ceremony at the North Portico on Wednesday morning, in which Obama made a priestly gesture over the bird before announcing: "You are hereby pardoned!" Obama tied the event to a series of executive actions he's been taking in recent weeks to jump-start the economy, steps that don't need congressional approval. 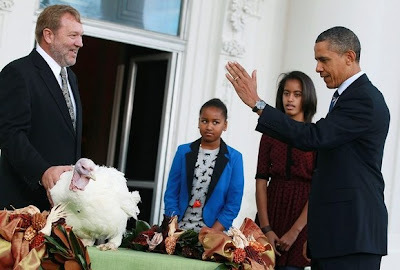 "Well here's another one: We can't wait to pardon these turkeys. Literally!" Obama said. "Otherwise they'd wind up next to the mashed potatoes and stuffing." Daughters Malia and Sasha joined him for the event; the First Family will later participate in a service event in Washington. There were 30 contestants for the designation of the National Thanksgiving Turkey. The two that won final pardons were raised by four students from Willmar High School in Minnesota. Now free, the birds will "retire to a life of leisure" at Mount Vernon, George Washington's home, Obama said. President George H.W. Bush was the first president to officially pardon a turkey in 1989, according to the White House, though some credit John F. Kennedy with starting the tradition in 1963.